Once you know what people believe you will know where to start building a firm case for a Christian worldview. If you missed the Conversational apologetics post I suggest you read it. It will help you discover what people believe, or what worldview they have. As a disciple of Christ we all know that it is our responsibility to share the Gospel of Jesus with those who ask us about our faith. You may even have the desire to do so, and have been preparing for an opportunity to do so when the chance comes. Where do you start? Should you take a straight path to the cross? Should you share Bible verses with them? While it is never wrong to share the message of the cross with anyone, there may be a few other helpful points to consider as you began building your case for Christianity. If you look at the illustration below, it shows you the progression that it takes to hold a Christian worldview. You cannot hold a Christian worldview until you move from an atheist position. Similarly, you cannot hold a Christian worldview, until you know what type of theistic position you hold. Do you believe in one God (monotheistic), more than one god (polytheistic), God is in everything (pantheistic), etc… Likewise, you will have difficulty trying to convince someone that the Bible is the inspired word of God, if they don’t believe that a God or gods exist. The same way someone will have difficulty with the claim that Jesus is God, if they don’t trust the Bible as a reliable source. As you talk and ask questions to others about what they believe you will discover what they believe and where they are in the progression above. Then you will know where to start with helping them along the way towards a Biblical worldview. 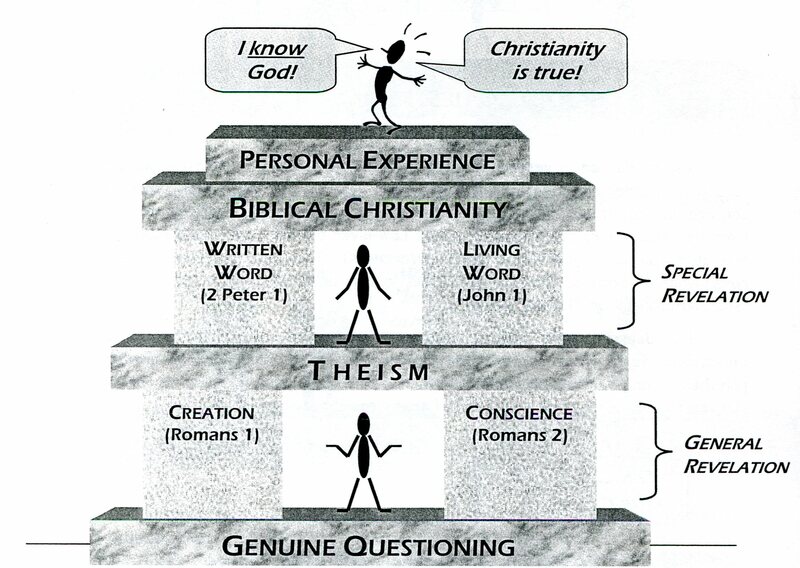 A friend of mine, Chris Sherrod, who teaches apologetics and has been published in several books uses an illustration of a set of pillars to show how the different evidence builds upon more evidence to provide a solid case for Christianity. Over the next weeks and months we will begin to break down the 4 pillars above and examine the evidence that God has given us. This entry was posted on Tuesday, October 4th, 2011 at 3:24 pm and is filed under atheism, Bible, creation, General Apologetics, Religous and Life. You can follow any responses to this entry through the RSS 2.0 feed. You can leave a response, or trackback from your own site.